Reina Sequera is back: You’ll get a million dollars! And you’ll get a million dollars! Everybody will get a million dollars! As you know, I have an obsession with no-hoper candidates in Venezuelan politics, and a slew of them have registered for the April 14th vote. 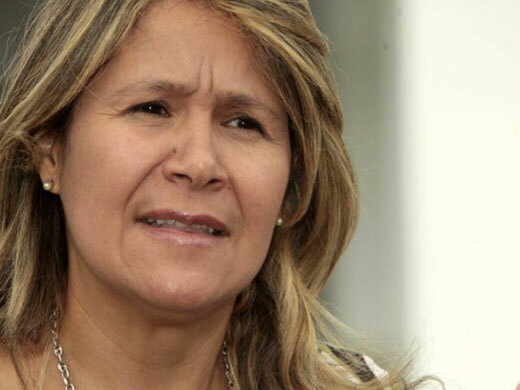 One of them is Reina Sequera of Poder Laboral, who became famous for her looney-tunes proposal to distribute $1 million to every man, woman and child in the country. She got 70.567 votes in October 7th, in third place. Most of her votes were from Unidad Democrática, a small party that switched its support from Henrique Capriles Radonski to Sequera at the last minute, even if HCR’s face was still on the ballot. Also in the running is a Christian pastor named Eusebio Méndez, who is representing an evangelical-oriented party named NUVIPA (New Vision For My Country). He’s now part of a chain of evangelical temples called Federation of the Christian Center of the Nations (CCN). No further details about him yet, but you can look his governing platform here. In the previous election there was another evangelical candidate Luis Reyes Bolivar, who came in fourth. He won’t run but instead he endorsed Nicolás Maduro. Other minor candidates include Fredy Tabarquino (JOVEN), Gonzalo Contreras (Cambio Pana) and Julio Mora (Udemo). 7-O’s last place holder Orlando Chirino won’t be on the ballot. If there’s no legal objection by the CNE, the final number of contenders will be eight. UPDATE: The CNE has rejected the candidacy of Gonzalo Contreras (Cambio Pana) because he didn’t present a governing plan (one of the legal requirements to run).